Die italienische „Bühne“ auf der Ketty La Rocca zwischen 1966 und 1976 mit theatralischen Aktivitäten, Performances, Einzel- und Gruppenausstellungen in Erscheinung trat, war außerhalb von Italien nur undeutlich wahrnehmbar, zuerst zu sehr definiert durch die Ideologie der Männer-Künstler der Arte Povera, dann durch die Jungmänner der Transavantgarde. Die Entwicklung von Ketty La Roccas Rezeption wird deutlich an den wenigen Ausstellungen, die 1973-75 mit ihren Werken im deutschsprachigen Raum stattgefunden haben. Deren Titel (Fotomedia/Medium Fotografie/Frauenkunst), zeigen die Schlagworte des Kunstdiskurses in der Mitte der 70er-Jahre. Von der künstlerischen Praxis Ketty La Roccas wurden die offensichtlichen Dinge, die Tatsache, dass Fotografie im Spiel war und dass wir es mit einer Frau zu tun haben, thematisiert. Damit waren die „Sackgassen“ geschaffen, in denen das Werk nach ihrem Tod verschwunden ist. Seit mehr als zehn Jahren bieten neue Begriffe einen veränderten Blick auf die Arbeiten La Roccas. Unter den Bedingungen von „Appropriation“ und „Rezeption“ sind die Kategorien männlich-geprägten Kunstschaffens wie Produktion und Originalität relativiert, die auch Fotokunst/Frauenkunst weiterhin durchziehen. Während das schmale Werk La Roccas unter solchen Bedingungen als Randfigur angesehen werden konnte, rückte es mit dem veränderten Paradigma ins Zentrum und erwies sich als eine der frühesten und stimmigsten Positionen in dem Feld, das durch das Auftauchen der nach 1945 geborenen amerikanischen Protagonistinnen eine Definition erfuhr. Nun ist der geringe Werkumfang Programm, die unstrategische Verwendung von Fotografie, Video, Theater, Performance, Collage, Zeichnung wird Standard. Die Opposition gegen die Installation ist notwendige Abgrenzung und Verweis auf die Utopie des schwer zu definierenden Ortes der Kunst unter den Bedingungen der „Künstlerin“. Die Ausstellung kam in Zusammenarbeit mit Nicolaus Schaffhausen zustande. The Italian stage upon which Ketty la Roca appeared between 1966 and 1976, with theatrical activities, performances and solo and group exhibitions, was not clearly visible outside Italy itself; overly defined at first by the ideology of the male Arte Povera artists, then by the young men of the Transavantgardia. The growth of the reception for Ketty La Rocca’s work may be seen in the few exhibitions that took place in the German-speaking countries between 1973 and 1975. Their titles (Fotomedia/Medium Photography/Women’s Art) reveal the buzz words of art discourse of the mid-1970s. They bring those obvious aspects of La Rocca’s artistic practice to the fore, i.e. that the works are photographic and done by a woman, thus creating the cul-de-sacs into which her oeuvre disappeared after her death. For more than a decade now, new concepts have enabled a different take on La Rocca’s work. The conditions of Appropriation and Reception relativise such male-oriented categories as production and originality, which still pervade photographic and women’s art. La Rocca’s small body of work, according to such categories, has been seen as marginal; the new paradigm draws it into the centre and reveals it as one of the earliest and most coherent positions in a field that was to be defined by American protagonists born after 1945. 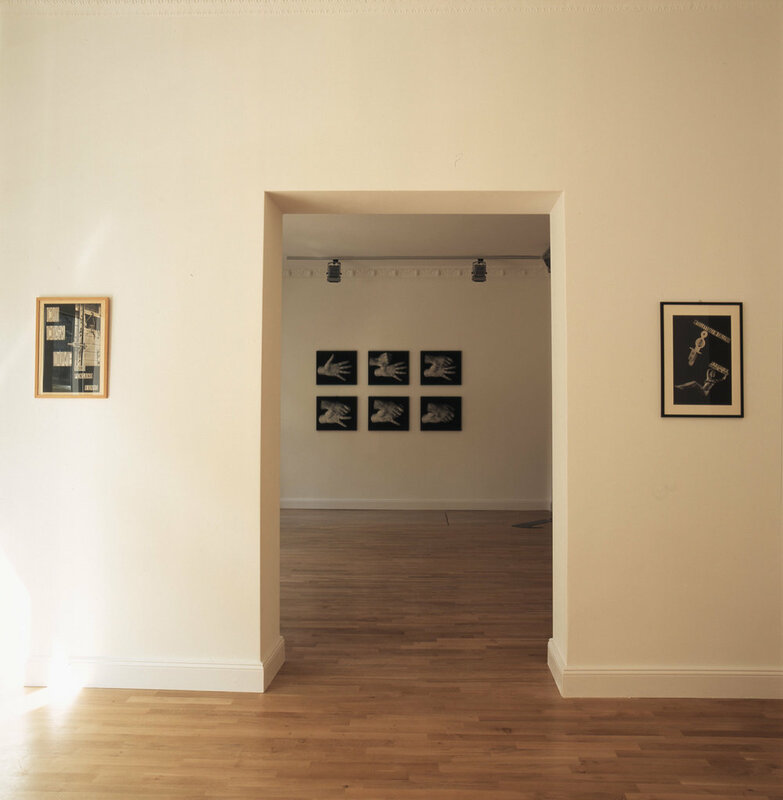 The narrow range is now the programme; the non-strategic use of photography, video, theatre, performance, collage and drawing is now standard; the opposition to installation a necessary dissociation and pointer to that Utopian, only obscurely definable site of art under the condition of woman artist. The exhibition has been brought about in collaboration with Nicolaus Schafhausen (Künstlerhaus Stuttgart). The Galerie Keinzle & Gmeiner is opening its new premises with an exhibition of works by the Italian artist Ketty La Rocca. Dating from the late 1960s and the 1970s, they provide a retrospective look at her output. Her work has rarely been shown since her early death in 1976 and a retrospective in 1978 at the Venice Biennale. Only in the past few years has interest in it returned, coupled with a deepened debate on the politics of identity and the social construction of the body. Born in 1938, Ketty La Rocca worked in a wide variety of media. She created drawings, collages and sculptures, but also made use of photography, video, performance and television. Her central motif, appearing again and again, is language – to be more exact, script – and language-like methods of communication such as hand gestures. In her early works, La Rocca combined cuttings of political slogans, for example, with found visual material to create associative contexts of meaning in opposition to the original message. Elegantly mounted in black and white on a monochrome background, these collages demonstrate the ambiguity and fluidity of language. They are an emancipatory attempt to apply mass-media pronouncements to the clarification of questions of power and gender relations. In later works this optimistic attitude is lost, to be replaced by a more basic investigation into script and meaning. Letters, words and sentences serve, irrespective of their reading sense, as visual or sculptural material. In other series, photographs of gesticulating hands take on the function of script to point out the connection between physical identity and language. Multiple exposures blend hand gestures and X-rays of La Rocca’s skull, its contours outlined with the repeated word you. Lucy R. Lippard, writing in 1975 about You, You (1973) in her essay Women’s Body Art, places La Rocca alongside the mainly American feminist artists whose concern with the female body is poetically motivated. But the you outlining the skull also refers to another problem: the relationship between language and image, which is dealt with even more clearly in Videotape, of 1976. The work consists of three parts, a photograph and two drawings. The extremely skilled photograph is of a television showing a close-up of two hands. In the first drawing, the outline of the television appears as almost illegible hand-written sentences following the photographic model. The third part retranslates this script into an image, a drawing in which the now meaningfully enhanced signs are reduced to lines, depicting no more than a reproduction of the photograph – the Diagram of the Phantom of the Original (Giorgio Verzotti). Proceeding from the understanding that language is not a natural, value-free medium, and that it transports cultural dictates and power relations, La Rocca takes script, reduces it to calligraphy and arrives at the visual. It becomes clear that language is not more objective or value-free than an image, but it can provide a meaningful opportunity to return to image production.